During the last week of October and the first week of November, you see children everywhere on English streets carrying strange effigies. They are usually made of old clothes, stuffed with newspaper and finished with a grotesque masque. The children will ask you for money, using the traditional words “A penny for the Guy!”. Since 1606 bonfires have burned on November 5th to mark the failed Gunpowder Plot. On that night, throughout England, towns and villages hold torch-lit processions, light huge bonfires and fireworks and burn the effigies of Guy Fawkes that the children have made ( a kind of dummy that represents Fawkes). It is the closest Britain has to France’s Bastille Day or America’s Independence Day (July 4th). Guido Fawkes (1570–1606), most commonly called Guy Fawkes, was a member of the group of Roman Catholic conspirators who attempted to carry out the Gunpowder Plot. The conspirators had planned to assassinate King James Ist (James VI of Scotland) and all the members of both branches of the Parliament of England. To do this, the House of Lords was to be blown up during the formal opening of the 1605 session of Parliament. 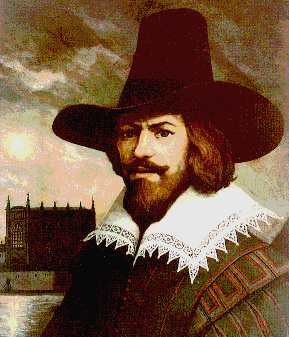 Guy Fawkes was responsible for the latter stages of the plan's execution. However, he was discovered before its completion. Following an interrogation, Fawkes and his co-conspirators were executed for treason. In the United Kingdom, Newfoundland, Canada, New Zealand, South Africa and parts of the USA the Gunpowder Plot is commemorated annually on Guy Fawkes Night, also called Bonfire Night. For some people it is a celebration of the plot's failure, for others it marks the loss of a folk hero. Guy Fawkes was born in York, where he was baptised. He grew up to be tall and of an athletic build with brown hair and a moderately brown beard. Fawkes converted to Catholicism at about the age of 16. He served for many years as a soldier, gaining considerable expertise with explosives. In 1593 he enlisted in the army of Archduke Albert of Austria in the Netherlands, fighting against the Protestant United Provinces in the Eighty Years' War. In 1596 he was present at the siege and capture of Calais. During the reign of Henry VIII and Elizabeth I, Britain had become a protestant country. But with the death of Elizabeth in 1603, the Tudor dynasty came to an end. A new king –James I – from a new Scottish dynasty – the Stuarts – came to the throne. However, many of the new king’s subjects remained faithful to Rome. They hoped that James would undo Elizabeth’s changes and return Britain to Catholicism. They were disappointed when this didn’t happen and began to conspire to kill James. It was to be a last desperate attempt to restore Catholicism as the official religion of Britain. The conspirators were a group of former soldiers. 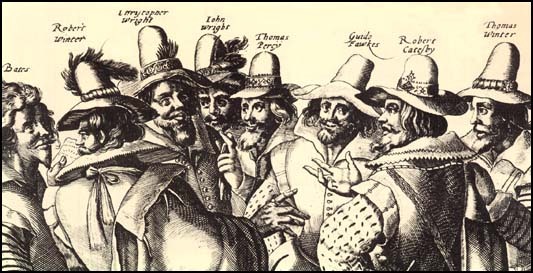 Guy Fawkes is the most famous since he was placed in charge with executing due to his military and explosives experience. They bought a house next to Parliament. It had a cellar directly under the House of Lords. They had hidden 36 large barrels of gunpowder, which they had brought along the Thames by boat at night. The idea was to fire the gunpowder and blow up Parliament, along with the king and all the members of the House of Lords and the House of Commons. The day chosen for the explosion was November 5th 1605, when the king was to open the new parliamentary session. Guy Fawkes stayed in the cellar to guard the gunpowder and to set the explosion. But several of the conspirators were concerned about fellow Catholics who would have been present at parliament during the opening. One of the conspirators had written a letter of warning to Lord Monteagle, who received it on October 26th. The conspirators became aware of the letter the following day, but they resolved to continue the plot after Fawkes had confirmed that nothing had been touched in the cellar. But Lord Monteagle had been suspicious and the letter was sent to the secretary of state. He then initiated a search of the vaults beneath the House of Lords. Of course, Fawkes was discovered and arrested during a raid on the cellar in the early morning of November 5th. He was tortured over the next few days. Eventually, he revealed the names of his co-conspirators. On January 31st, Fawkes, Wintour, and a number of others implicated in the conspiracy were taken to Old Palace Yard in Westminster, where they were hanged, drawn, and quartered. As was the customs, the plotters’ heads were displayed stuck on poles in London and their bodies were quartered and sent to the four corners of England for public display.